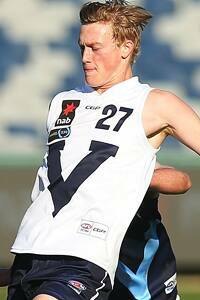 Mitch McCarthy joins Collingwood with the seventh overall selection in the Rookie Draft. "Mitchell is a 19-year-old athlete whose first love was basketball, which took him to the USA in 2015. He returned in Christmas 2015 but missed the first six weeks of the pre-season so he played catch-up. He added 12kg to his frame and is a 60 metre kick with lots of tricks in the air. He has a new age ruck style (a 205cm hand span) but will develop as a key defender at AFL levek. He will become a better player the more games of football he plays - he was limited this year due to a broken foot. He might take a year or two before playing at AFL level but will be exciting," - Dandenong Stingrays talent manager Mark Wheeler, Inside Football, November 2016.